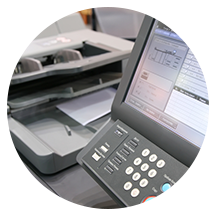 With over thirty laser printers available for printing various personalised documents, CAB has the capacity to print extremely large quantities on a daily basis. We pride ourselves on high quality, efficiency and security which feature strongly from start to finish in each and every job we do. Send us your database of statements and our team will import and reformat all your data for the final laser print, in the shortest possible time. In addition to printing statements, we also offer a wide range of other laser prints, including a large variety of fonts, barcodes, special characters and graphics for you to choose from.